Instant Pot vs. Pressure Cooker: Which One Is The Winner? Have you ever struggled to figure out the differences between an Instant Pot and a Pressure Cooker? If yes, then let us help you to put your matter to rest. People value convenience, and what’s more convenient than a good pressure cooker that can help shorten your cooking time by up to 70% while still providing superior food taste and nutritional properties? I bet none. When shopping for a pressure cooker, there is one popular brand name that has caught great attention from many customers. Yes, I’m talking about the Instant Pot. If you haven’t already known, Instant Pot is head and shoulders above all other electric pressure cookers out there, tailored to replace most kitchen appliances including a steamer, rice cooker, food warmer, yogurt maker, sautéing vessel, and so much more. 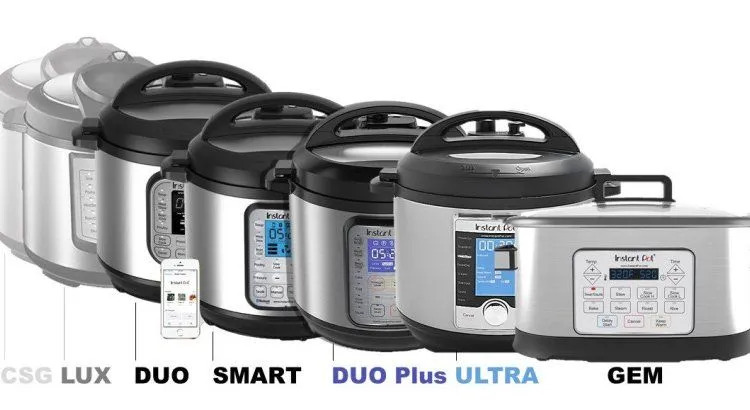 Until now, the Instant Pot family consists of 5 members, namely the LUX, the DUO, the DUO PLUS, the SMART, and the ULTRA. They all have a manual program, a stainless steel cooking surface, and most importantly, a wide range of capacity (from 3 to 8 quarts) to meet the needs of different customers. While the Lux and the Duo seem to be widely used and most suited for those with tighter incomes, the Smart and the Ultra are high-end models that come with more special features so as to provide you with the best possible cooking experience. For instance, besides allowing users to control the cooker from their cell phone or tablet via Bluetooth or WiFi, the Instant Pot Smart can also handle almost all kinds of cooking tasks. It enables you to make detailed, customised programs, as well. Plus, through the Smart Pot app, you can create your own recipes and customize results to your personal taste. It sounds very impressive, right? Click here to view the full collection of Instant Pot. With the many benefits offered, both Instant Pots and Pressure Cookers have proved to be the valuable appliances for many home cooks. So far, they have many things in common. They serve up quick, nutritious meals with the least amount of effort. They’re super easy to clean and compact enough to match with any kitchen decor. On top of that, thanks to abundant safety features, they’re extremely safe to use, giving you many years of reliable performance. There is no need to worry about explosions or fire disasters during operation – the main reason why these products have grown in popularity over the years. That being said, to optimize for the top position in this competitive industry through sharing the same business objectives does not really make sense. Instead, each of them needs to have at least one innovative feature that allows their product to differentiate itself and stand out from its counterparts. At this point, I am thrilled to inform you that Instant Pot is doing very well to convince that it is the best player around by never stopping to make great difference regarding to the product’s performance, durability and cost efficiency. So, how is it different from the regular Pressure Cookers, exactly? What Are The Main Differences Between An Instant Pot And A Pressure Cooker? Before we start, let me state clearly that at present there are 2 types of pressure cookers for you to choose from, namely the stovetop pressure cooker and electric pressure cooker. Although both of them are created to provide users with the best and most memorable cooking experience, each type does have their own characters to maximize their performance. At this point, to clear things out, we will take a look at two of the popular models on the market when it comes to pressure cooking: the Instant Pot DUO60 and the Presto 01781 stovetop pressure cooker. Well, without wasting any further time, let’s hop on the adventure of learning some of the basic differences between these pressure cooker versions. It’s an intelligent electric cooker that has the functions of multiple cooking appliances. It speeds up the cooking time by 2 to 6 times, and consumes 70% less energy while still preserving nutrients in foods efficiently. It’s a breeze to clean up. Not only can it perform all the functions of a stove-top pressure cooker well, but it also comes with more possibilities, such as an automatic shut-off function, variable cooking programs, delay timer, LED control panel. It has a stainless steel interior which offers easy clean-up, a gleaming modern appearance and long-lasting performance. It is UL and ULC certified with ten different safety elements, giving you complete peace of mind when cooking with it. Owing to the housing around the inner pot, it’s relatively bulky, so storage might be a challenge, especially for those with space constraints. Because there are quite a lot of buttons for the wide range of functions it can provide, a learning curve might be required to master the appliance. It’s not good at canning food. It gains pressure faster and takes a little less time to release pressure, thus reducing cooking time. It can last much longer than electric models. Since there is no automatic cooking program or scheduling feature, you have to babysit it on the stove for proper results. It only has one pressure setting and can be used only for pressure cooking. It’s a little bit noisy. There is no doubt that both the Instant Pot and traditional Stovetop Pressure Cookers are great products. They work well and do make great differences. However, every product has its pros and cons. So basically, just make sure your product of choice can meet your desired specifications. If you value durability more than convenience, then the conventional Stovetop Pressure Cooker is definitely a no brainer. Believe it or not, what you receive when cooking with this traditional cooker is lots of tasty foods that might remind you of the way your grandmother prepares dinners. On the other hand, if you’re looking for something safer and more accessible, and won’t mind paying a little more for better, convenient features, the Instant Pot series would be worth every penny.